The King is Dead – Long Live the King introduces the state of politics on Skellige, but The Witcher 3 is filled with warm human moments and you’ll get one of those, too. The first thing you should do is open your quest menu and select the optional objective so the HorsePS trail leads you there first. If you’re coming direct from the last quest you’ll pass a notice board and a quest marker to load up on secondary objectives. Stop at the Herbalist for a game of Gwent if that’s your bag. Get a shave if you like, too, and speak to the innkeeper to buy Gwent cards and play a hand with him. In Yennefer’s room, you can rifle through her things if you like. Your goal is the chest in a corner. Grab some clothes – Yennefer doesn’t seem to like either of them much, and prefers your black and white Nilfgaardian outfit if you have it still, but she won’t scold you as long as you’ve made an effort, so get changed before following your HorsePS. Take Roach; it’s a much longer trip than it looks. Inside, remember you’re supposed to be being diplomatic and not drink as you chat. Accept the challenge to race Cerys if you like; it’s not hard to beat her as long as you haven’t changed back into heavy armour. When you’re allowed up, you can walk around and chat to various parties. Speak to Bran’s widow and you can again decide whether to drink or not. Speak to the pair standing in a window alcove and you can have your future read and again choose whether to drink or not. Finally, at the door on the way to your waypoint you’ll meet two arguing jarls. If you are anything but conciliatory you end up in a brawl, but nobody tries to get you drunk. Turns out Yennefer has an ulterior motive, and still treats Geralt pretty poorly, keeping him in the dark. Still, you share a cute moment as you progress, while you listen to two guards discussing very important matters. When you reach the locked door, follow Yennefer out the window – notice she doesn’t bruise her hands clambering over cold stonework – and then back inside. Wander around examining the animals before heading for the door. Defend yourself from the attack; don’t worry, they’re not as scary as the red icons suggest. When you’ve recovered, proceed into the next room. You can look at everything, but especially grab the mead before examining the statue at the end with the hidden door and map. The correct item to place there is a mug of mead, but you can also try the skull and pinecone if you fancy. Before you proceed through the door, you may want to save, and apply Elemental Oil to your silver sword. Head into the secret chamber and battle the Earth Elemental there. It’s not so different from the Gargoyles and Golems you’ve fought before; use Quen so that its attacks bounce back at it, use Yrden to make it easier to dodge, and don’t attack when it is hunched up in defensive mode. Yennefer will distract it admirably, allowing you to hit it with heavy strikes from behind. After the battle, gas starts filling the room. Run around until Geralt and Yennefer panic and decide to teleport out. You have a limited amount of time to choose a response to help her target the spell. SPOILER ALERT: Skip past the italics if you don’t want to know the outcome of this choice. If you choose “choke and die” you end up back at the wake. If you choose “kiss”, you end up back in Yennefer’s room. From here, you can elect to hurry back, or choose the other option for a romantic (?) interlude. In either case, you eventually end up back at the wake as the claimants to the throne step forth in a pretty dramatic scene. Afterwards, you chat with Crach – oh yeah, I knew this quest had a point – and pick up three more quests, including our next stop: Echoes of the Past. Onwards to Echoes of the Past, or back to The Witcher 3: Act One – Skellige. 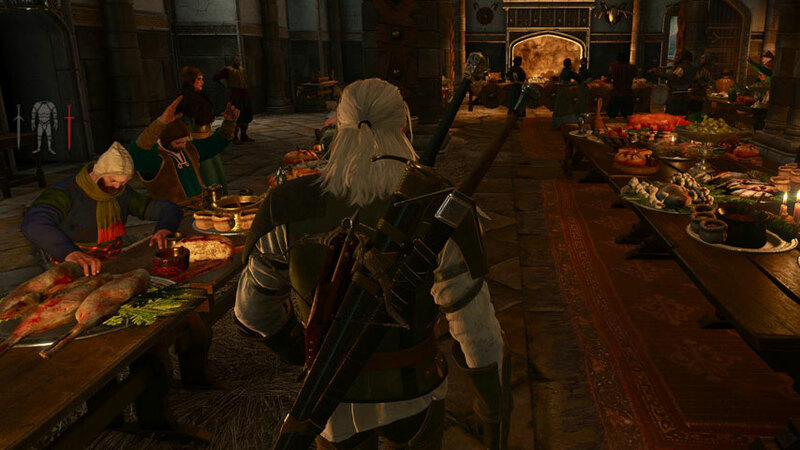 Back to The Witcher 3 guide and walkthrough.